Tourism and artifacts: a successful combination? Artifacts and lived places, two theoretical concepts that are used in tourism studies. This essay is based on the concepts of seeing a tourism destination as a lived place and of using artifacts in the management of tourism. In the following section these theoretical concepts will be explained based on how they are used in theory. After the theoretical explanation the proposition will be given and arguments will be provided. The essay will focus on artifacts used to solve waste problems in tourism destinations and use examples from the destinations Sumba and Belitung, two upcoming tourism destinations in Indonesia. In tourism destinations interactions between people and other people take place. Also interactions between people and nonhuman things take place, for example between people and objects or between people and habits of others (Kisora, 2018). This means that the objects and facilities in the destination can both be used by people living in the place and by people temporarily visiting the place, the tourists. Both have their influence on the destination and form it because of being there and making use of it (Kisora, 2018). Furthermore, emotions can be connected to places. An example can be a memorial statue. This can function as a place to which people come in order to deal with their memories. On the other hand, it can also function as a tourism attraction. If multiple uses and views of a place collide with each other, this can cause problems to occur (Kisora, 2018). Problems can also occur when the interaction between people and objects collides. For example when the usage of a certain object gets misinterpreted because of different ideas of people about how to use objects. If behaviour is not steered at tourism destinations this can lead to conflicts (Kisora, 2018). Not only social conflicts can occur or conflicts due to cultural differences, also the destination can be damaged because of immoral behaviour. An example of this could be tourists littering. If we take a look at Bali, Indonesia, we can see that mass tourism created some serious problems over there. Interactions between people and objects can cause problems. On the other hand the literature suggests that artifacts, which are objects, can prevent problems from happening or from occurring. The steering effect of artifacts? Let’s first start with the question: “what are artifacts?”. Simply explained, an artifact is an non-human object which is created by humans. These artifacts can be used to trigger certain behaviour, for example slowing down in speed because of a speed bump (Duineveld, 2018; Rosenberger, 2014). They can also seemingly take over human behaviour, for example closing a door can be done by a groom instead of a human (Latour, 1992). These seem to be quite obvious examples as people are probably aware of their function. However, this has to do with the underlying actor-network. Knowing how to use certain artifact has automated certain human behaviour (Rosenberger, 2014). For example you know that a green traffic light means you can drive, so you will do this automatically when the green light occurs without having to think what action you should do. Furthermore, artifacts can make one outcome easier and another one less easy, for example traffic lights make it more easy to cross a crossing safely, but makes it harder to cross whenever you want. The steering of behaviour by using artifacts happens also within the tourism industry (Duineveld, 2018; Buijtendijk, 2018; Latour, 1992). Making a key of a hotel room very heavy and unpractical to carry with you steers people in following the moral behaviour of leaving the key at the desk in the hotel (Buijtendijk, 2018; Latour, 1992). This causes the decrease in number of lost keys. Another example would be placing fences to make people stand in line for, for example, the check in desk at an airport (Duineveld, 2018). This stimulates the moral behaviour of being patient and discourages behaviour like jumping the queue. Solving problems and transforming unwanted behaviour into moral behaviour with the use of artifact seems so easy according to Duineveld’s and Latour’s vision. Also in the article by Rosenberger (2014) it is suggested that when people are familiar with artifacts they will choose to perform the steered to behaviour more easily than performing different behaviour. In the example he uses it is suggested than people would rather sit on a park bench than lay down on it, just because they are used to the fact that sitting is what should be done on a public bench. In the tourism industry waste is increasingly becoming a problem, especially in tourism destinations. It is a problem occurring in lived places, for example a park that serves multiple purposes and because of interactions between people and for example objects like packaged food from supermarkets. Artifacts used to manage such waste problems certainly exist. 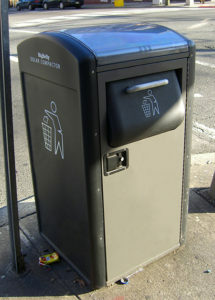 One of the most common artifacts used in the western world to manage waste disposal is the bin. Other artifacts can be signs that tell you littering is not allowed or that make you aware of the negative consequences of littering. So, why not using these artifacts to solve waste problems in Sumba and Belitung as using artifacts seem an easy tool to manage behaviour? 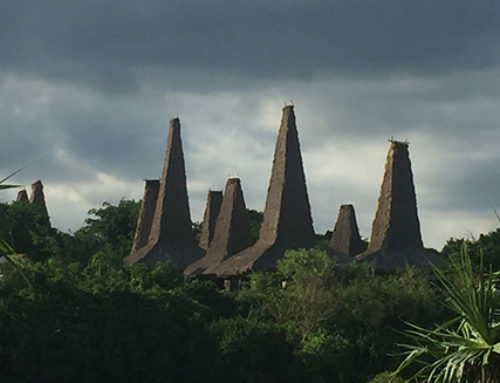 Well, as I observed in Sumba and Belitung the implementation of artifacts that work fine in the western world did not have the same effects in Sumba and Belitung: people did not perform the intended behaviour and problems were not solved. Therefore I think that implementing artifact in tourism destinations might be less useful than the suggested steering power is. That is why the proposition of this essay is: “The implementation of alien artifacts in tourism destinations will not lead to successfully steered behaviour.”. The following section will show theories that might explain why. As explained earlier littering and waste problems can take place in lived places. 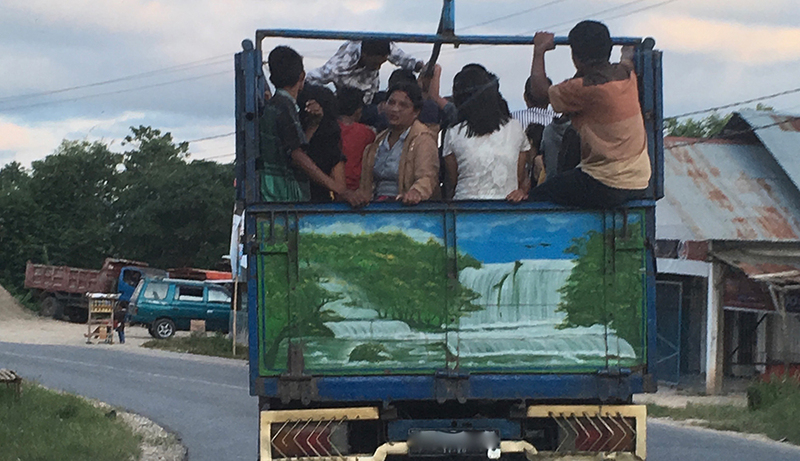 In Sumba and Belitung this problem takes also place in lived places. For example on beaches where both tourists and local inhabitants come. Waste is left behind here by people who eat on the beach, think of food packaging and left-overs of picnics. Tourists who visit these beaches for the view and the scenery do not enjoy waste laying on the beach and tend to avoid places with litter eventually. So, littering can make a tourism destination less attractive to tourists. But problems can also occur the other way around: tourists littering can cause inconvenience for the local people. This can even lead to restricting the number of tourists allowed in the destination. If artifacts are used as solution to the waste problem, all actors involved in waste disposal at the destination should be connected to the script of the artifact. Each artifact comes with its own script. This means that, as explained by Akrich (1997), artifacts created by humans and applied by humans are created in such a way that they are part of a script. This script tells how the artifact should work and interact with the space that it is in and with the other actors present in this space (Akrich, 1997). Therefore I would argue that if the artifact does not match with the other actors in the space, the artifact might lose its steering power. To go back to t he example of the waste problem in Sumba and Belitung. Imagine the artifact that can be used to solve the waste problem is placing bins, as this is also used as solution in the western world. On Sumba one argued that placing bins was not the solution as the Sumbanese people did not have the right mindset. But what if the actors in Sumba do not match with the script that is linked to the artifact, the bin? For example, one of the actors in this space are humans. If these humans do not, as according to the script of the bins, throw their waste in the bin or if actors like waste collectors lack in the space, then the scripted outcome that the designer intended to have with the bin will not work out as planned. It would be hard to blame the mindset of the people. 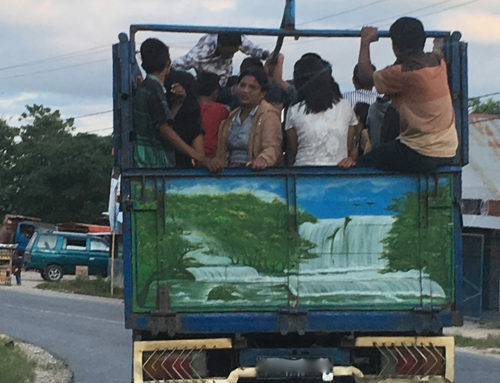 If the mindset would align with the idea that waste should be thrown into a bin, then the other missing parts of the actor-network, like waste collection of full bins or recycling centres, then the script would still not be working in Sumba. Another way of seeing the connection that an artifact needs in order to work rather than scripts, is seeing them as part of an actor-network (Rosenberger, 2014). In an actor-network both humans and non-humans are included. The artifacts can be seen as the non-humans of an actor-network and the humans that are involved with the artifact, by using it for example, are the human aspects of the network. In these networks the non-humans can replace human actions and also their agency. One of the most famous examples is the example of a speedbump. This speedbump replaces the agency of policeman correcting the behaviour (Rosenberger, 2014; Latour, 1992; Duineveld, 2018). According to Rosenberger (2014) the use of a certain artifact can become automated behaviour when you are part of the actor-network. This means that when people have used artifacts over and over again they become used to the interaction with this artifact and the result that comes with it. If someone is familiar with the artifact bins, they stop thinking about what they should do with it and automatically use it to throw in waste. As we are coming from a society which is used to bins, we forget to see the network around the bins that make throwing waste in them an effective way of disposing waste. There is a theory that this automation of performing the scripted behaviour of the artifacts is not in need for an actor-network. It suggests that the network creating is automatically enforced by the artifacts when they delegate tasks back to the humans (Latour, 1992). For some artifacts this delegated task is clear, if you want to use a door you have to open it yourself. However, if someone never saw a door in his life before, would he know what to do without explanation? The same goes for bins. As the artifacts do not tell you your delegated task, it is hard to know how to use the artifact. Of course people can be told that they should use the bins for throwing in waste. To bins actually more than one human task is connected. bins will become full eventually, a good collection system is needed to make it an effective solution for the waste problem. If no good collection system is available or trust is lacking, then why bothering using bins? As we are so used to bins, all actors connected to make it work are quickly overlooked and forgotten when they are used to manage waste problems somewhere where the network is absent. Also, artifacts are known for their power to steer people in the direction of moral behaviour. To go a step beyond the bins, the final destination of waste can be landfills. If a system is created that the trash out of the bins will be collected and finally brought to a landfill, the bins are steering to behaviour which contributes to the landfill. In Sumba I found out that people do not like the idea of landfills. So for them burning waste or throwing waste on the ground wherever you are is seen as more moral behaviour than behaviour that contributes to landfills. As the idea of what is moral behaviour differs between Sumba and the original space in which bins are used for the artifact loses its power to steer in the direction of morality. Furthermore, people do not always follow the most moral ways (Altman, 2012). So although an artifacts tries to create certain behaviour, it is possible for people to do the things differently. A sign can tell you to throw your trash in the bin but still humans have the power to do otherwise. To conclude I would like to take a look at the proposition of this essay again. The proposition was: “The implementation of alien artifacts in tourism destinations will not lead to successfully steered behaviour”. As can be read in the former sections of this essay, there are multiple theories that make this proposition likely to be true. These theories form a rebuttal of the arguments against. Personally I still agree with my proposition. However one might argue that it is hard to make very firm conclusions about artifacts. So, one could say that it is hard to say that “As the implementation of an artifact managed to solve a problem here, so will it do anywhere else”. On the other saying that an artifact will have no chance of working when placed in a different space might also be to straightforward. So, nuances would be the best and it might be better to say that “the implementation of alien artifacts in tourism destinations will have less chance to successfully steer behaviour.” than a firm statement like “the implementation of alien artifacts in tourism destinations will not lead to successfully steered behaviour.”, or the other way around. What I think is the most important thing when implementing artifacts is taking their networks into account. Artifacts can work fine, as long as their script is executed in the right way via the actor- network. This network is, however, easily overlooked as the ones implementing the artifacts are often familiar with the working and because their behaviour is automated, they forget to see the complexity behind the artifact. So, The implementation of artifacts in tourism destinations to manage behaviour should been thought trough very well. Not only do you have to deal with other settings in which the script might not work as wanted, also tourism and especially the problems takes often place in lived places. This means that there are not only a lot of different actors involved, but also that these actors can attach different meanings to the same place and therefore use it for different purposes. And if that would not be enough things to take in to account before implementing artifacts to manage behaviour, you might also stumble upon different visions on what is actually moral behaviour, especially in tourism destinations where people from different nationalities come together. Despite all these things that should be taken into account, it could be that placing alien artifacts without their network would still be as efficient or maybe even more efficient than doing nothing to manage the waste problem. So it might be, who knows, maybe these artifacts will create their own purpose and network? Akrich, M. (1997). The De-scription of technical objects. In W. E. Bijker & J. Law (Eds. ), Shaping Technology/Building Society. Studies in Sociotechnical Change (2nd ed., pp. 205-224). Cambridge: Massachusetts Institute of Technology Press. Buijtendijk, H., (2018). Destinations as Networks (PowerPoint slides). Retrieved from N@tschool. Duineveld, M., (2018). Where are the missing masses? The mass tourism project (2016-2026) (PowerPoint slides). Retrieved from N@tschool. Kisora, Y., (2018). What is a tourism destination and how to study it (PowerPoint slides). Retrieved from N@tschool. Latour, B. (1992). ‘Where are the Missing Masses? – The Sociology of a Few Mundane Artifacts’. In W. E. Bijker & J. Law (Eds. ), Shaping Technology / Building Society. Studies in Sociotechnical Change (pp. 225–258). Cambridge: Massachusetts Institute of Technology Press.